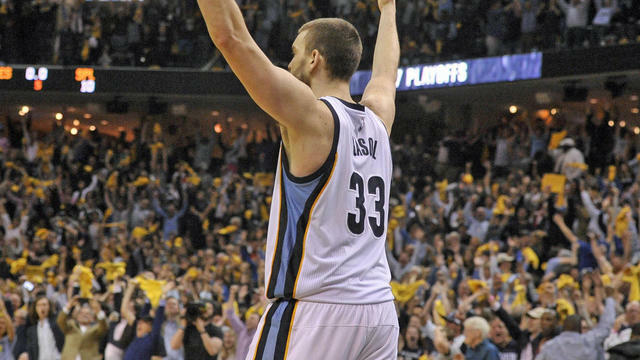 NBA Playoffs: Grizzlies win wild one against Spurs, even series 2-2.For a brief moment Saturday, it looked like the Memphis Grizzlies might roll to a comfortable victory. With 4½ minutes left in Game 4 of their first-round series against the San Antonio Spurs, they led 88-80 after a 3-pointer from Mike Conley, who had been making big plays all game. The Spurs were suffering from another off-night in Memphis, with LaMarcus Aldridge almost invisible offensively aside from a brief burst in the third quarter and Tony Parker carrying much of the load. Their best player, Kawhi Leonard, had 19 points on 6-of-18 shooting, and San Antonio was 4 for 21 from 3-point range. At that point, Memphis might have felt a bit of relief. It had turned the ball over 17 times and was still in control. Zach Randolph had scored only 10 points on 3-of-11 shooting, but things were OK. Or, at least, they might have been OK against a different team. “The Spurs don’t ever let you breathe,” Grizzlies coach David Fizdale said. As soon as it seemed like Memphis might separate itself, Leonard got his enormous hands on a pass from Conley, which was intended for JaMychal Green. This started a fast break, which triggered some classic San Antonio ball movement, which resulted in Leonard hitting a 3-pointer. On the Spurs’ next possession, Leonard drew a foul on the inside and hit two free throws. Then he poked the ball out of James Ennis’ hands and went coast to coast for a layup, plus the foul. The next time San Antonio went down the floor, Leonard hit another 3 to give his team the lead. It all happened in 85 seconds. Leonard’s personal 11-0 run put the Spurs in the driver’s seat, but Memphis managed to keep it together….